Universally compatible 75x75mm and 100x100mm VESA standard! Just measure the screw holes behind your monitor (in millimeters) to ensure compatibility. Full motion arms can swivel, tilt, and extend your monitors! Optimize your viewing angles and experience your screens like never before! Made from premium aluminum die-cast for durability, heavy-duty function and sleek look. 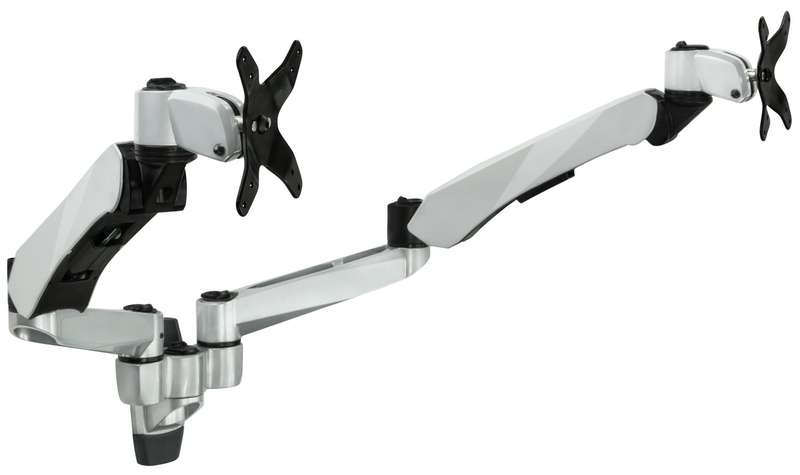 Full motion capability; height adjustment through spring arms, swivel/articulating at each arm connection, tilt and rotate at the monitor holder. You can change monitor orientation from landscape (horizontal) to portrait (vertical) format in seconds without removing the screens. The modular design allows each piece to be connected easily. Just install the wall mount piece to a wall stud and use the quick-connect feature to add each arm piece one at a time. The assembly will be set up in merely minutes.